Huawei released its 2018 Annual Report today. According to the report, the company maintained strong business growth in 2018. Its sales revenue rounded off at CNY721.2 billion, up 19.5% year-on-year; its net profit reached CNY59.3 billion, up 25.1% year-on-year. In 2018, Huawei invested CNY101.5 billion (14.1% of its sales revenue) in R&D, ranking fifth globally in The 2018 EU Industrial R&D Investment Scoreboard. Over the last ten years, Huawei's R&D expenditure has reached more than CNY480 billion. According to official data released by the World Intellectual Property Organization (WIPO), Huawei filed 5,405 patent applications to this organization in 2018, ranking first among all companies globally. 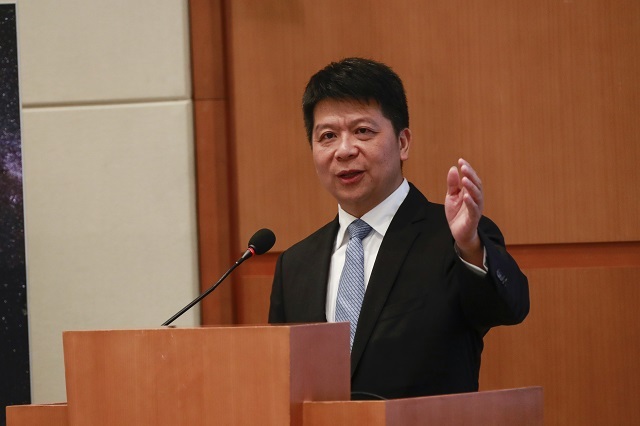 At the release of its annual report, Guo Ping, Huawei's Rotating Chairman, said, "Information communications technology is rapidly working its way into every industry. This has triggered a digital, intelligent transformation – the driving force behind our digital economy. Through heavy, consistent investment in 5G innovation, alongside large-scale commercial deployment, Huawei is committed to building the world's best network connections. Throughout this process, Huawei will continue to strictly comply with all relevant standards to build secure, trustworthy, and high-quality products. As we work towards this goal, we have been explicitly clear: Cyber security and user privacy protection are at the absolute top of our agenda. We are confident that the companies that choose to work with Huawei will be the most competitive in the 5G era. And countries that choose to work with Huawei will gain an advantage for the next wave of growth in the digital economy." Guo emphasized, "The easiest way to bring down a fortress is to attack it from within. And the easiest way to reinforce it is from outside. Moving forward, we will do everything we can to shake off outside distractions, improve management, and make progress towards our strategic goals. We will continue to strengthen operational compliance, ensure business continuity and sustainability, and cultivate an open ecosystem where all players collaborate and prosper together. In addition, we will continue our organizational transformation to inspire greater passion and vitality across the organization." In its carrier business, Huawei launched its latest 5G and SoftCOM AI solutions, focusing on making them as simple as possible to use and maintain. 2018 also saw ongoing innovation in domains like premium home broadband and the Internet of Things (IoT), helping carriers seize new growth opportunities. In 2018, the sales revenue of Huawei's carrier business reached CNY294 billion, roughly the same as the year prior. In its enterprise business, Huawei continued providing cloud, big data, artificial intelligence (AI), and IoT solutions, as well as a range of products for data centers, all-flash storage, and WiFi. By integrating these technologies into its digital platform, Huawei has facilitated the construction of smart cities, safe cities, and smart campuses, and has helped drive the digital transformation of its customers in the finance, transportation, and energy sectors. In 2018, the sales revenue of Huawei's enterprise business reached CNY74.4 billion, up 23.8% year-on-year. In its cloud business, Huawei launched 160 cloud services and 140 solutions, and worked with its partners to serve customers worldwide with 40 availability zones across 23 regions. Huawei has grown its list of partners to more than 6,000 in this domain, and is actively exploring the use of its AI services in more than 200 projects across 10 major industries. In its consumer business, Huawei further increased its share of the global smartphone market and has further enhanced the positioning of its high-end devices. It has also made major breakthroughs in building an intelligent ecosystem for all user scenarios. In 2018, the sales revenue of Huawei's consumer business reached CNY348.9 billion, up 45.1% year-on-year.